The No. 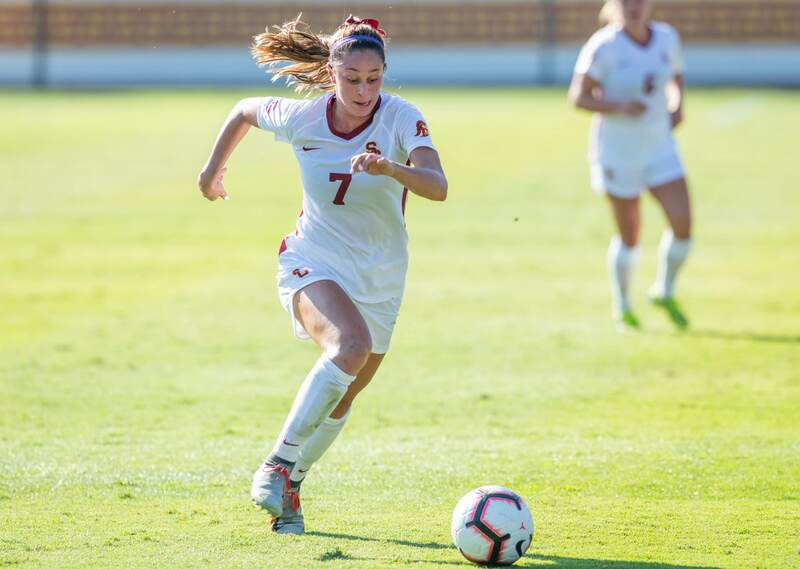 4 USC women’s soccer team took home two impressive wins at home this past weekend after defeating Missouri and San Diego 2-0 and 3-2, respectively. The Trojans move to a record of 6-0-1 and continue their undefeated streak as they advance into their last game before the end of non-conference play on Friday. The Trojans had a slow start to their game against Missouri, missing several good looks on goal. Sophomore midfielder Savannah DeMelo came through in the 27th minute with an in-stride shot to the far post off an assist from sophomore forward Tara McKeown, securing her fourth goal of the season. Junior midfielder Jalen Woodward scored USC’s second goal, and her first career goal, on a shot to the corner that dipped just under the post after ricocheting off a Tiger defender. Redshirt sophomore goalie Kaylie Collins left this game with her fourth solo shutout of the year, after only having to make one save in the game. The Trojans outshot the Tigers 31-4 and brought their goal differential up 17-1, the best start to a season in USC women’s soccer program history. 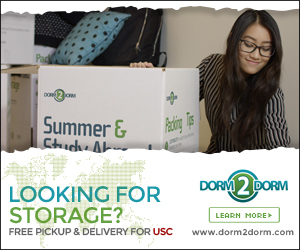 Sunday’s game against the Toreros was the first time the Trojans have trailed all season and the first time USC has given up multiple goals in one game. The Toreros scored both of their goals in the first half, each one followed by a Trojan goal. The Trojans’ first goal was from junior forward Natalie Jacobs who scored her third goal of the season with a header off of a cross kick from McKeown in the 22nd minute. A long shot past the goalie from senior defender Ally Prisock allowed freshman forward Penelope Hocking to bury a shot in to the wide-open net in the 35th minute, leaving the score 2-2 at the half. After a challenging first half, the Trojans didn’t hesitate to take control in the second half, dominating position and allowing only one shot on goal from the Toreros. Senior forward Leah Pruitt secured the Trojans’ 3-2 win with a shot inside the far post three minutes into the second half. With the Toreros goal in the 11th minute, the first scored against the team since the Cal Poly game on Aug. 24 snapped their scoreless streak of 441 minutes. 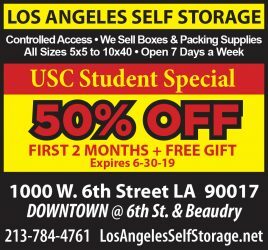 The Trojans are looking to add another win to their undefeated season and restore their scoreless streak when they take on Long Beach State (4-3-0) on Friday. Long Beach dominated in its last game against St. John’s University, beating them 6-0 in a shutout victory last Friday at home. Jumping into an early lead with junior midfielder Taylor Bistline’s goal in the third minute, the 49ers came out strong and maintained that energy throughout both halves of the game. Two more goals in the first half, one rainbow over the Red Storm keeper and 3 more goals in the second half settled the 49ers into their 6-0 win. The 49ers finished the game with 21 shots and nine on goal, as four different players saw their first goals of the season. With a 3-0 lead heading into the second half, 23 players got onto the field before the game was over, as head coach Mauricio Ingrassia turned to his bench to secure the win. Goalies senior Imani McDonald and junior Riana Castaneda had a combined nine saves for the 49ers in their third shutout game of the season. McAlpine is hoping that going into Friday, the Trojans will be able to come out strong and drive the tempo of the game. With Collins earning Pac-12 Goalie of the Week and five players with multiple goals this season, the defensive and offensive lines are looking strong heading into Friday’s game. The Trojans will be taking on Long Beach Friday at 1 p.m. on McAlister Field on senior day. After this game, the Trojans will close begin conference play against University of Washington on Sept. 22.